Second hand and used Kids Jackets for sale in your area. All of the top items on the best UK second hand classified and auction sites in one place. THIS HOODIE IS IN GOOD CONDITION, BUT THERE ARE SOME STAINS TO THE FRONT, PLEASE SEE PIC. Mountain Warehouse Kids - waterproof jacket in good condition. Includes detachable hood and fleece. Age 11-12. Collection only. 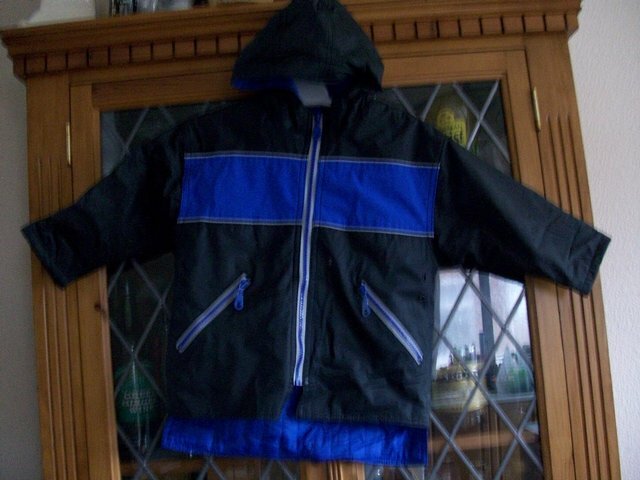 Tresspass boys Kids Waterproof Windproof High Performance Blue Jacket Size 9/10. Condition is Used. Dispatched with Royal Mail 2nd Class. Peter Storm Kids Waterproof Jacket 13 Years. Condition is Used. Dispatched with Royal Mail 2nd Class. Levi’s denim jacketExcellent condition, approx 7/8 years old no rips or tears, genuine Levi’s. Kids Everton football team jackets LB about 8-9 yrs XLB about 9-10 yrs Â£10 each great condition. Columbia sport reversible jacket and pants. Age 7/8. Only worn for one ski trip in ex. cond. Postage for extra. tools, hard hat and work jacket all used but in good condition Â£10 for everything ? in Chorley. New unworn jacket M&S. age 11-12. Bought as seen. Original price was Â£39 never fit my son. Bought as seen. Cash on collection. based in N Manchester. Kids swimming jackets good condition age 2 years up it does say smaller but there quite big. Kids Adidas Puffer Jacket Black Age 9-10yrs boys. Condition is Used. Dispatched with Royal Mail 2nd Class. Worn and washed a few times but no holes in the jacket. Great condition. BARBOUR ! KIDS BOYS XL 12-13 YRS ! NAVY BLUE HOODED JACKET HOODIE COAT HOODY ! I think the 14 is the age but unsure. good condition kids Helly Hanson jacket. pick up Prescot Rd area near morrisons not far from St Helens town centre. Kids Next Denim Jacket Size 2-3. Condition is Used. Dispatched with Royal Mail 2nd Class. Kids 11-12 M&S black jacket. New with tags never worn. Bought as seen. Cash on collection only. based in N manchester. Children's regatta jacket, faux fur lined, polyester outer material. lovely and warm jacket. Girls Gap Kids Denim Jacket in light denim. Nice detailing and press stud fastening. Age 8-9 years, 130cm. Has been worn several times and washed and in good, clean condition with plenty of wear left. Boys zoogs swimming jacket helps with learning to swim.keeps child a float in water.Build in float in the jacket.Age 4-5 years worn once in very good condition,comes with original hanger.